To achieve our desired outcome of emoji dancing like sugar plum fairies in our address bar, we need a loop. And really, all we need is a loop. We start the loop, it loops, and we’re happy. So here’s our first loop, a spinning emoji moon. I think when they added this sequence of emoji they must have had this in mind right? You can click the toggle checkbox above to see the result of this loop in your URL bar. We use a sine wave controlled by time and position to select which color we want. This gives us a nice loopy color changing effect! But it’s not just emoji that give us a means to pump graphics out of our URL bar. 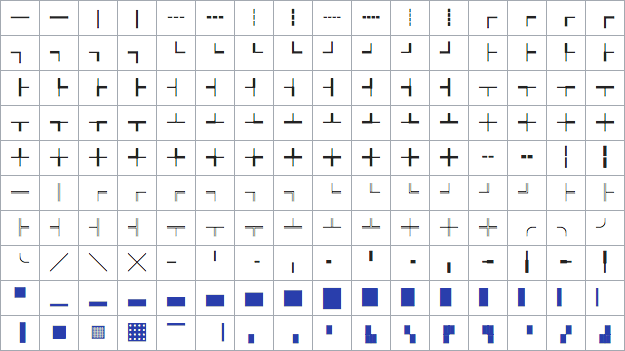 There’s a whole boatload of unicode characters of interest to our goals. I liked this look so much I put it up permanently at wavyurl.com. In an attempt to reduce the frivolity in our little experiment, I came up with the idea to show a web video’s progress in the URL. I simply attach a function that renders our progress string to the “timeupdate” event for a video, and voila! A video progress indicator in the URL, complete with the time and duration! With the above checkbox checked, you can use the video below to try it out. Okay, calling this progress bar “useful” is a stretch. But if I squint, I can almost see a scenario where it would be useful to have this in a video sharing URL. Like YouTube has the option of creating a link to a video at a specific time. Might it not be cool to include a visual indication? Hmmm? Maybe there is some more useful implementation of this “technology” that I haven’t come up with. I’ll keep thinking on that. And hey, maybe you can come up with something? You may be wondering why I used “location.hash =” instead of the newer and shinier HTML5 History API. Two reasons. One solvable. The other less so. Both inconvenient. Issue 1 is also a feature of the History API: It actually changes the whole URL path, not just the hash. So if I use the History API and change our page to “/🌑🌘🌗🌖🌕”, it’ll look nicer than having tacked on a #. But it also means my web server must be able to response to “/🌑🌘🌗🌖🌕”, or the user will be out of luck if they refresh, or otherwise navigate to the modified URL. This is doable, but trickier than using “location.hash =” which doesn’t require me to prepare the server in any special way. Throttling history state changes to prevent the browser from hanging. Now if I stay under that limit I’m fine. But c’mon, 3 frames a second just doesn’t cut it for the ooey gooey URL animations I desire. Good boy Firefox on the other hand doesn’t seem to give a hoot how many times I push a new history or how quickly. Which is gosh darn thoughtful of it. But breaking in two major browsers, plus neccesitating the web server configuration to fix Issue 1, makes me willing to put up with a little # in the URL. I’ll leave it there. But I will tell ya that I’ve got a few ideas for making tiny games that display in the URL bar. Especially given the Braille Characters that we have yet to explore. So stay tuned for that. If you have questions, comments, or simply want to keep up with my latest tinkerings, check me out on Twitter: @MatthewRayfield. Or subscribe to my almost-never-bothered email list here.